Two people have been charged with involuntary manslaughter after they “knowingly created a fire trap” inside an Oakland warehouse where a fire killed 36 during an electronic dance music concert late last year, prosecutors said Monday. Derick Ion Almena, 47, the property manager who converted the warehouse into an artists residence and underground concert venue known as the Ghost Ship, and Max Harris, who served as the venue’s “creative director” and ran the concert that took place on the night of the blaze, were arrested Monday and charged with 36 counts of involuntary manslaughter, according to Alameda County Dist. Atty. Nancy E. O’Malley. Almena and Harris allowed as many as 25 people to illegally reside in the warehouse, failed to provide any fire suppression equipment and filled the building with flammable materials from “floor-to-ceiling,” creating a deadly “labyrinth” from which the victims had little chance to escape, according to a probable cause statement filed Monday. On the night of the fire, Harris rented the upstairs portion of the warehouse to a promoter and was on the premises to oversee the event. During preparation for the electronic dance show, Harris allegedly blocked off a second stairwell that had served as an exit, leaving guests only one way out when flames began to devour the building. The building’s power failed almost as soon as the fire began, and those trying to flee had to navigate a narrow, wooden staircase that some witnesses described as a “gang plank” as they ran from the flames. Almena had previously ordered the illegal construction of that staircase, prosecutors alleged Monday. Harris was arrested in Los Angeles County on Monday morning, and Almena was captured in Lake County, O’Malley said. It was not immediately clear when they would appear in court to answer the charges. Investigators conducted 75 interviews, executed 12 search warrants, reviewed 6,000 documents or pages of reports and catalogued 300 pieces of evidence during the months-long investigation, she said. “We continue to mourn the loss of the 36 young and vibrant men and women, 36 members of our community who should be with us today,” O’Malley said. Assistant Dist. Atty. Teresa Drenick would not say if anyone else, including building owner Chor N. Ng, would face charges in connection with the fatal fire. “As of today, the charges that we’ve filed are the charges that stand,” she said. Drenick also said the cause of the fire will likely remain undetermined, as the blaze swallowed up most of the evidence arson investigators would need to determine what started the fire. The warehouse fire broke out during a Dec. 2 concert, trapping scores of attendees inside. All of the victims died of smoke inhalation, according to coroner’s reports. They ranged in age from 17 to 61. The deadly inferno has opened the city to rampant criticism. Public records revealed that police and fire officials had been called to the building several times amid mounting evidence it had been converted into an illegal residence. Oakland officials have repeatedly denied that fire and building officials were aware of the danger within the heavily cluttered 10,000-square-foot warehouse. The fire chief has insisted that the department never inspected the location or responded to a dispatch call there in more than a decade, and that city officials believed it was used as a warehouse, not as a concert and living space. Oakland Mayor Libby Schaaf applauded the charges Monday. A city building inspector who visited the warehouse just before the fire was unable to gain access to it, officials say. In the probable cause statement, prosecutors said Almena and Harris repeatedly lied when asked by police or fire officials if people lived inside the building. Almena allowed more than two dozen people to reside in the building at one time, charging between $300 and $1,400 rent for a space in the ramshackle housing, court documents show. Public records released by the city in February show the building had been subject to at least 10 code enforcement complaints. City officials also visited the warehouse numerous times in the years before the deadly blaze. The warehouse was one of several properties owned by Ng. Her daughter, Eva Ng, 36, has said the building was leased as a studio space for the art collective and was not used as residences. Almena, the last lessee on the building, had advertised the building on Craigslist as a "hybrid museum, sunken pirate ship, shingled funhouse, and guerrilla gallery.” He lived in the Ghost Ship with his girlfriend, Micah Allison, and their three children. They were not present the night it burned. 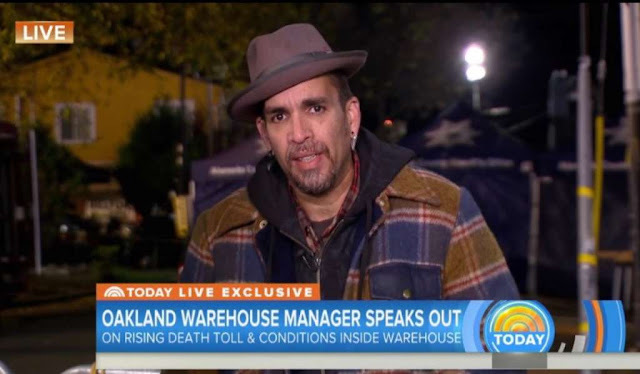 In a disjointed interview on NBC’s “Today” show conducted just days after the fire, Almena offered an apology, but bristled when asked if he should be held accountable for the deadly blaze. The litigators have previously said the officials investigating the case have a “conflict of interest” because they were likely to face civil suits in connection with the fire. The families of the victims filed a civil suit naming Chor Ng, Almena, Allison and Harris — under the name “Max Ohr” — and PG&E as defendants earlier this year. That, she said, is very high standard given prosecutors won’t be able to tell jurors how the fire started because they say they are not sure. Daly said defense lawyers will seek to undermine the prosecutors’ theory with underlying issue of them not knowing its “origin and cause.” She said they will seek to suggest that the cause was unpredictable and series of events so rare that no one could foresee the deadly sequence. “When you don't know the origin and cause, that makes for reasonable doubt,” she said. Former Los Angeles Dist. Atty. Steve Cooley, however, said Almena’s and Harris’ careless behavior is likely to resonate with jurors. “It is not so much the cause of fire that matters. Much more important is recklessness in having that building packed with stuff and occupied in violation of just about every safety code in the city and the state,” he said. Earlier this year, Almena’s legal team released a 10-page report claiming the fire actually started in an adjacent building. 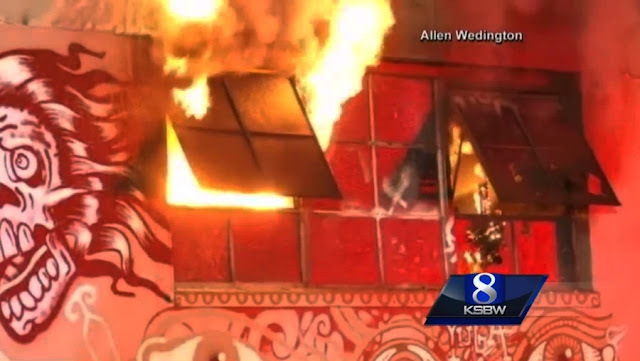 People who had lived in the Ghost Ship building or attended events there described a maze-like fire trap filled with wooden pallets, propane tanks and gas-powered generators that could have either served as tinder or exploded during a fire. Shelley Mack, who said she paid $700 to live in a trailer near the building from November 2014 to February 2015, said the building was overcrowded. She shared a bathroom with as many as 20 tenants, depending on the day, and the building often lacked heat or power. “There was no electricity, and it was freezing in there,” she told The Times last year. In the months after the fire, investigators with the U.S. Bureau of Alcohol, Tobacco, Firearms and Explosives scoured the charred husk of the warehouse. ”It was cluttered with carvings, mannequins, paintings, artwork, scraps of wood, pianos, furniture, tapestries and several recreational vehicles,” according to the suit, which claims the building did not have adequate fire safety measures, extinguishers or overhead sprinklers. 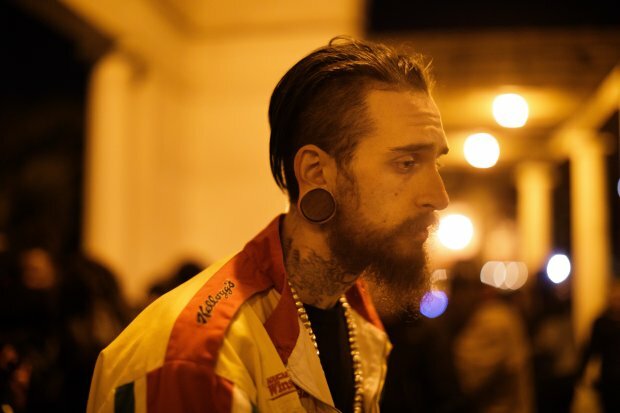 Prior to the fire, Harris warned the building’s owners that its electrical system was subject to “overexertion.” A former resident of the Ghost Ship also told the owners that people were illegally residing inside the warehouse, and the landlords agreed that “was a problem,” according to the suit. Numerous residents had also warned Almena of the unsafe conditions at the building, the complaint said. Queally and Winton reported from Los Angeles. St. John reported from Oakland.